Saturday the 19th of January saw us getting together for the first time in 2019 for our annual Alf Luckman Memorial Fish & Chips Run. Scroll on, and enjoy a few photos of the event with thanks to Ingo Weinberger and a report thanks to run organiser Matt Crawford. As is usual, the first event on the MGCC Sydney calendar is the Alf Luckman Memorial Run. The run originated from the efforts of Eric & Dawn Hayes. It started off as a very small affair and was eventually taken over by Alf Luckman, when it became the “Fish and Chips Run”. Over the years this run has become one of the favourites of the year despite the usual heat that accompanies it. This year we were blessed with quite temperate weather and a good cloud cover. The attendance was significantly better that expected, with a total of 79 participants, in 41 cars. Virtually all models from TAs to the MG6 were represented. These included one TA, one TB, one TC, two Y types, one TD, two TF(1s), 7 MGAs, two Magnettes, 17 MGBs, two RV8s, one MGF, two MG TF(2s), one MG ZR and one MG6. It was a great surprise to see so many MGAs, many of which had not been seen for quite a few years and they included two hard tops and a Twin Cam. At the designated meeting point, The Bull & Bush Hotel parking lot at Baulkham Hills, eight cars and thirteen intrepid adventurers, some of them first-timers for the event, assembled. Among them were Martyn and Alison Wise, from the MGCC Yorkshire Centre in the UK, driving an MG TF(2). 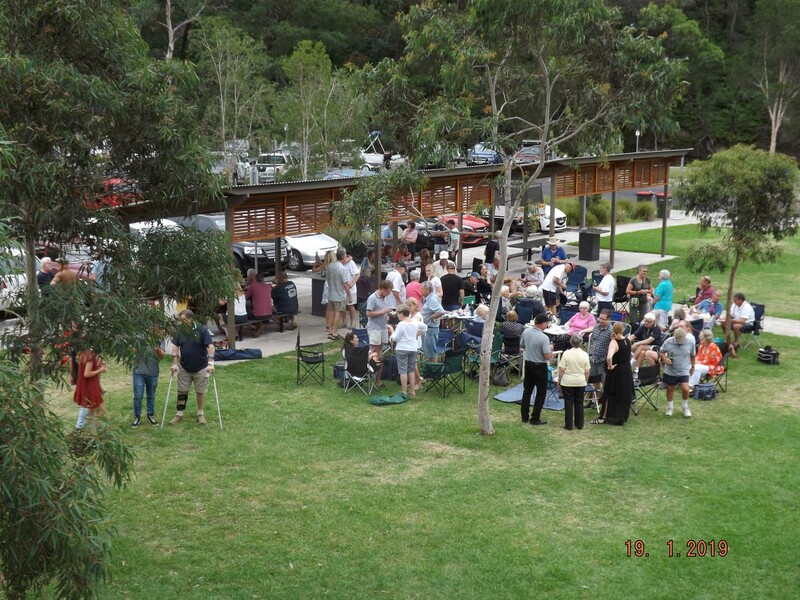 At the designated time, 4pm, we all set of in convoy, with Steve Foldhazy taking the lead, to Berowra Waters Picnic Grounds. All agreed that the route taken was very pleasant and picturesque, and we arrived at the destination in two groups, a faster and a slower cohort. The faster group was comprised of an MG ZR, an MG TF(2), two Y types and an MG TF(1). John Chadban driving the MG TF(1) remarked that it was quite a spirited run, which he greatly enjoyed allowing him to give the car a bit of a workout. We parked nose to tail in car/trailer spots, just after 4:30pm. Most Club members were already there, having driven directly to the site. They had already set up their positions in the two large shelters there, however most were seated at tables on the grass in the shade provided by the shelters. Soon the talk was about MGs in general, particularly their inability to tolerate hot conditions and what a great day we had chosen for the event. The Berowra Waters Fish Cafe did a roaring business, selling a variety of fish meals that were very tasty, and by all reports, as good as the members had eaten, however I did note the café did not rate a mention in the Sydney Morning Herald as one of the top four in Sydney. I guess Berowra Waters may not be regarded as Sydney. I had spoken to the manager a week before the event, warning them that we were coming and although they had put on more staff, as I had underestimated the numbers, they were quite pushed. Even so I was impressed by their overall efficiency and pleasant manner. As evening approached a cool breeze sprang up over the bay cooling things down further. The day ended around 8 – 8:30 pm with everyone making their own way home, either via the punt up to the Pacific Highway or back up Bay Rd eventually to Old Northern Rd and onto Windsor Rd. I must thank the members who attended the meeting making it certainly the most attended Fish & Chips gathering that I have been involved with. I was greatly impressed by the number of beautifully presented MGAs, as they seem to be a rarity on these runs. Many thanks to Ingo Weinberger for posting his photos on the website. Photos by, and thanks to, Ingo Weinberger. No Replies to "Photo Gallery: 2019 Alf Luckman Memorial Fish & Chips Run"